I interviewed proprietor Nick Wetzel for British Expat and he said he was very pleased with the move and that the regulars were all happy with it too. 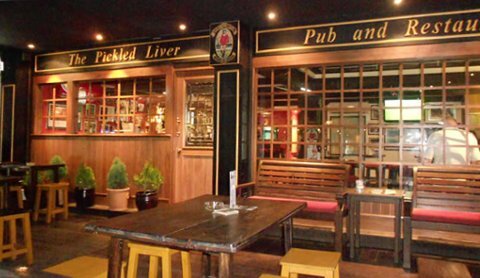 I happened to be in Bangkok on my own for a few days and had no problem at all in going there unaccompanied, so apart from all the other attributes of the pub, I’d also say it was a good place for a woman traveller to go by herself. No hassles there at all. Also, the staff are very friendly and helpful, so you’re well looked after. There’s always plenty going on at the Pickled Liver. They have a wide selection of draught and bottled beers, ciders and stouts as well as wine, spirits, cocktails and soft drinks. Plus there’s a menu of tasty pub food, such as fish and chips. You can find all the details on their website. 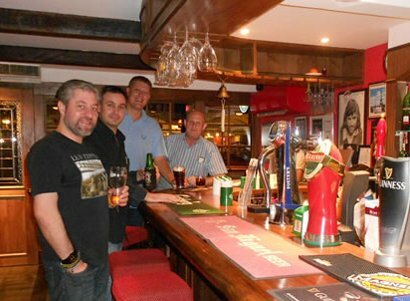 They have a pub quiz on Thursdays, live music on Fridays, sports on TV, plus darts and pool. 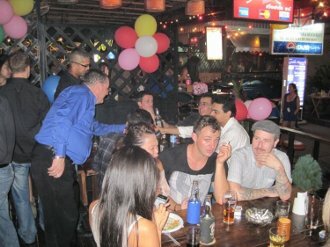 They also cater for parties as well as having their own special events. Have a look at their website to see what’s on. This entry was posted	on Friday 9 March 2012 at 08:31	and is filed under Thailand. You can follow any responses to this entry through the RSS 2.0 feed. You can leave a response, or trackback from your own site. I dropped in on Sunday to meet up with an old pal, and found to my delight that the Pickled Liver was serving Morland’s Old Speckled Hen on draught. So I ordered a pint. It was superb – the first proper draught pint I’ve had in eight years. (Sorry, Diageo – nice though Guinness is, you have to be in Ireland to fully appreciate it.) I’d started to forget what I was missing, but Hen and the Liver brought it all flooding back. It was quite an emotional moment. Good one, Nick!